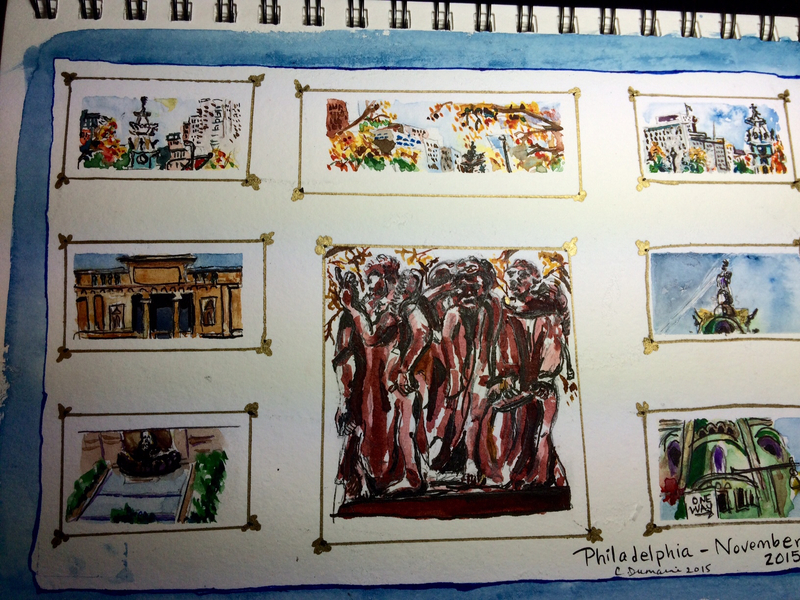 In Philadelphia on this Veterans’ Day, I had the chance to stop into the Rodin Museum following a lovely lunch with a long-time colleague and friend over at the Barnes Foundation Museum. 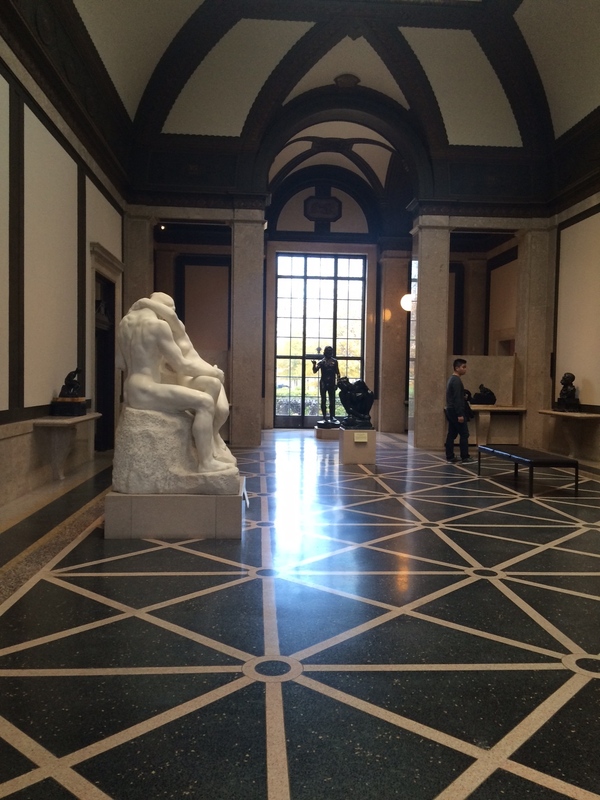 A few steps away from the Barnes, an astounding place which overwhelms the senses (and simply must be seen to be believed), was this quiet monument to Rodin. Framed by glistening fall leaves still damp from the recent rain, the museum was an oasis away from crowds. Only a few people were visiting it, and in its small galleries I was often the only visitor–amidst a great many distinguished faces, however, including of persons I’d only read about but never before seen. 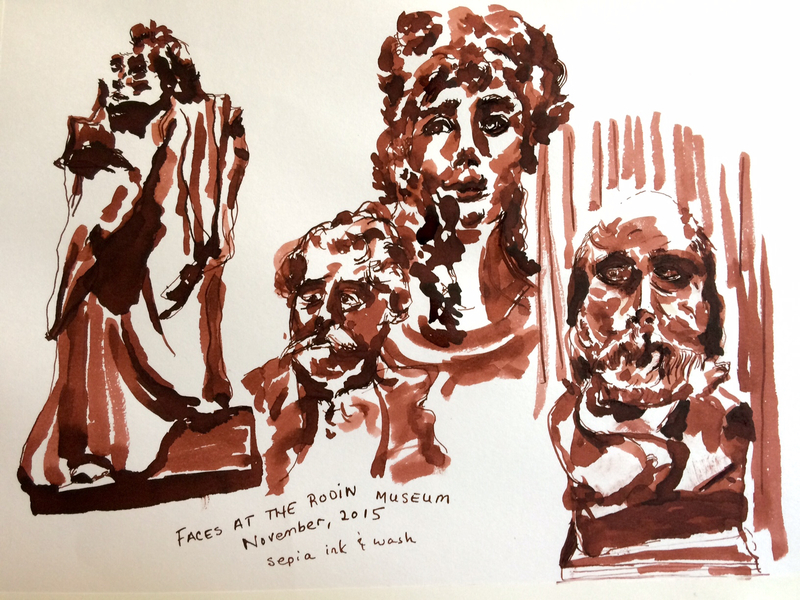 In the side rooms, tables were arrayed with books about Rodin, and it was permissible to sketch the sculptures and busts, a daunting but inviting prospect. As the staff began to arrange the rooms for a private event, including a dinner, I was encouraged even to stay and sketch, which I did first in pencil, and later in this ink wash as an experiment. It was fun to imagine what a private dinner party would be like in the extraordinary center hall of this peaceful place, but I left long before the guests arrived.